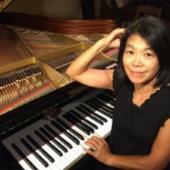 Yukiko Oba has performed extensively as an accompanist for recitals, choruses, master classes, and composers’ projects. Ms. Oba is a graduate of Kunitachi College of Music in Tokyo. She began playing piano at the age of six in her native Japan. She has been a member of the accompanying staff at Boston Conservatory since 1996 and has performed with many acclaimed Boston area singers including soprano Elisabeth Phinney and baritones Victor Jannett and Robert Honeysucker. This past season Ms. Oba was privileged to accompany master classes by Christine Brewer, Dawn Upshaw, Thomas Hampson, and Kirstin Chávez among others. She resides in Weymouth, MA with her daughter and husband, with whom she frequently plays piano for four hands pieces. In her free time she enjoys running—particularly marathons.